While this past week would have been a week where I would catch a few movies at home, the arrival of a certain Spider-Man game for the PS4 ended up keeping me pretty much focused on that. Thankfully, there was some fun with movies to be had here and there though. While I’m mostly anxiously awaiting what’s coming this week with the first Captain Marvel trailer supposedly coming on Tuesday, I did spend some background time with a couple of movies. I revisited The Living Daylights with Timothy Dalton’s first turn as Bond and was reminded why he’s one of my favorites. I also checked out Disturbing Behavior which is stupidly fun but has some fun actors, including very young James Marsden. I had such a crush on Katie Holmes back during this period with Dawson’s Creek as well. 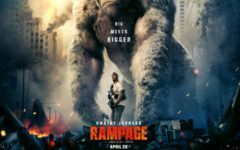 One recent new film that I got the chance to take in was Rampage. I had missed the timing to see it in the theater earlier this year as it was something I wanted to see with my kids. I had grown up playing the arcade game and they played a lot of it when they were young on the PS3, so they had an affinity to it as it was a great introductory game for kids with plenty of silliness. The film has plenty of silliness and plot holes as well but it was a goofy kind of fun that survives on the charm of its lead with Johnson to be sure. I mean, it’s not high art or anything but you can definitely feel for the George ape and just the way the whole thing unfolds. Jeffrey Dean Morgan plays his usual role but it’s also damn charming and a welcome change from how these roles are usually cast. With that film being a cheap pickup through iTunes for $10, I also grabbed a few other things to get through eventually. I got the Book Club film since I adore all the actresses involved in it, especially having grown up watching a lot of 70’s and 80’s Diane Keaton movies, never mind Candice Bergen. I also got another recent film with The Endless that was on the cheap as it’s a kind of cult film/almost found footage film that looked interesting. I also got for $5 a film that I really enjoyed in theaters a few years ago with The Age of Adaline. I typically don’t care much for Blake Lively but everything about this film just clicked for me. Now I’m just waiting on Solo to come out as I really want to revisit that and get it into my digital playlist. He likes to write a lot, as you can see. Chris Beveridge – who has written 51696 posts on The Fandom Post.